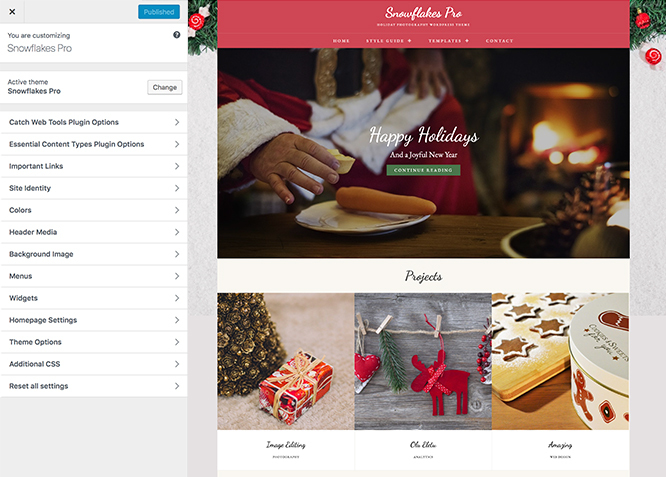 Snowflakes Pro is a Christmas version of our popular Photography WordPress theme – Fotografie. 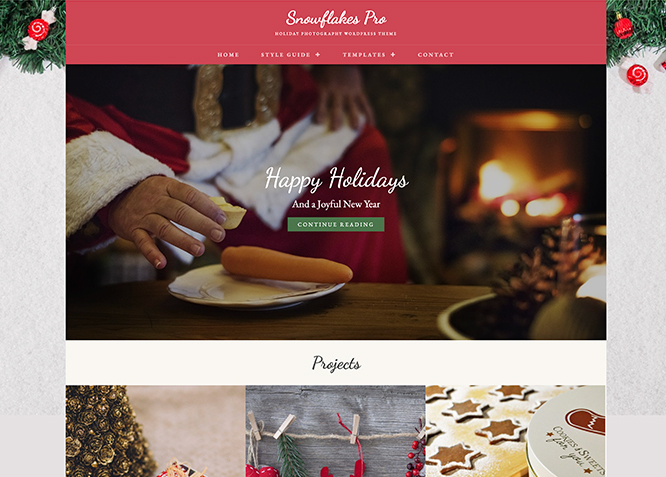 Snowflakes, child theme of Fotografie is a Christmassy Photography WordPress theme that will give your website a warm and welcoming look and feel of Christmas. Snowflakes Pro is simple, elegant and responsive WordPress theme. It is ideal for creating photography websites for photographers, graphic designers, freelancers, artists, or bloggers. It comes with all the basic features such as header media option, hero content, portfolio, featured slider, featured content, custom menus, color scheme and more. 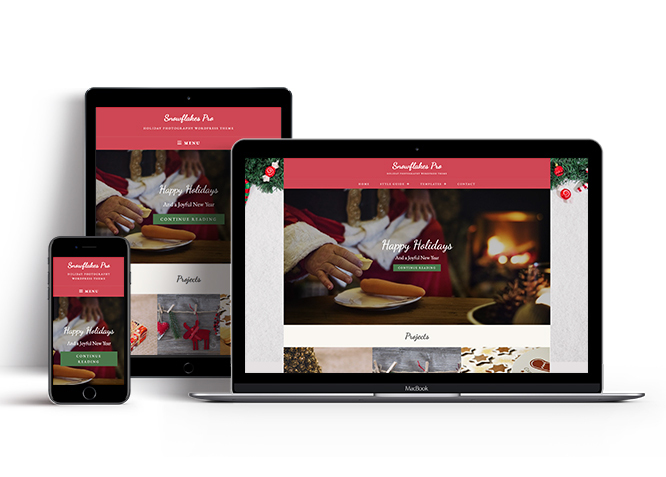 With all these incredible features, you can create a pleasant website of any kind with a welcoming Christmassy look. Snowflakes Pro purely focus on providing your website a jolly look with its vibrant color palette. This theme is translation ready. For more details check out the Theme Instructions. Snowflakes Pro currently has 12 widgetized (Sidebar) areas thay are:1. Sidebar, 2. Footer One, 3. Footer Two, 4. Footer Three, 5. Footer Four, 6. WooCommerce Sidebar, 7. 404 Page Not Found Content, 8. Optional Page Sidebar, 9. Optional Post Sidebar, 10. Optional Sidebar One, 11. Optional Sidebar Two and 12. Optional Sidebar Three. Go to "Appearance => Widgets" or "Appearance => Customize => Widgets" in WordPress. Snowflakes offers exciting Menu Options! This theme supports and recommends using "Custom Menus". You can create Custom Menu through "Appearance => Menus" from your WordPress Dashboard. Snowflakes Pro has 2 Site Layout, 4 Singular Content Layout options and 4 Woocommerce Layout options image layout to choose from "Appearance => Customize => Theme Options => Layout Options"
Snowflakes Pro has 14 Widgets to choose from. They are: 1. CT: You can add widget in widget area as per your need.Go to this link for more detail.